Gareth and I love to go out for breakfast on the weekends, but lately we’ve been trying to stay in more to save money and to be healthier. 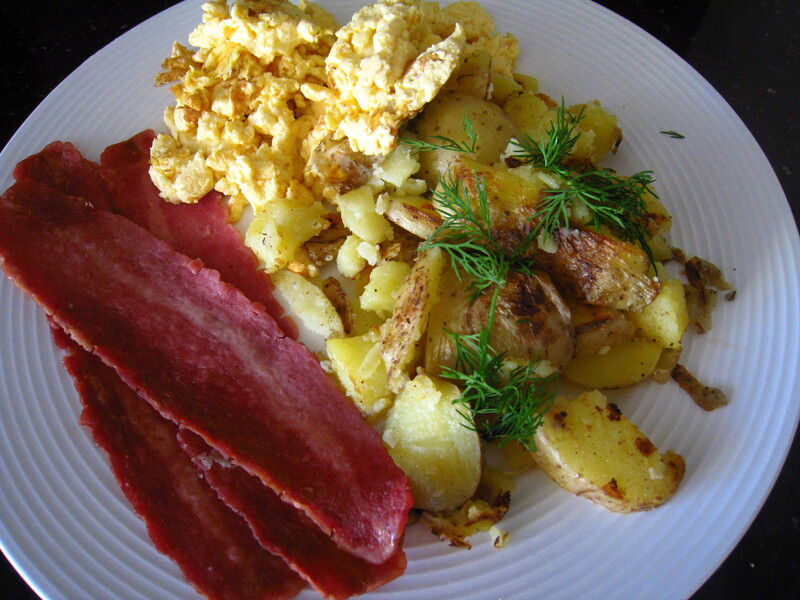 This is a typical breakfast you could order from a restaurant (eggs, bacon, hash browns) but is made with lower-calorie, lower-fat ingredients. Give it a try! Spicy Scrambled Eggs: Mix the egg beaters in a bowl with 2 tbsp hot sauce. (Frank’s Red Hot is great for this) Scramble the eggs on medium heat in a non-stick pan, no need to add any oil to the pan but you can spray Pam. Sprinkle garlic salt and black pepper to taste when eggs are cooked. Turkey Bacon: Place turkey bacon onto a plate in between two pieces of paper towel. Microwave for approximately 4 minutes or until crispy. Sautéed Potatoes: Microwave or boil the potatoes until they are soft (about 6 minutes in the microwave.) Slice them into thin pieces while hot. Heat 1 tbsp olive oil in a pan on high-medium heat, and add potatoes. Press the potatoes into the pan using a spatula- this will help them crisp up. After a few minutes, flip the potatoes to crisp the other side. Sprinkle garlic salt and black pepper to taste. If you’d like, sprinkle on some fresh herbs (I used dill) for some extra flavor when plating.